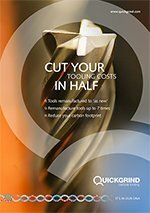 When a manufacturer of carbide cutting tools claims it can halve tooling costs by remanufacturing them to ‘as new’ condition, up to seven times, customers can be forgiven for being a little sceptical. This is why Quickgrind has just launched its special ‘trial’ offer to ensure manufacturers can experience the performance benefits of remanufacturing first hand. Managing Director Ross Howell explains: “The trial has been designed to make it easy for busy manufacturers to experience the difference remanufacturing makes – after all ‘seeing is believing’. We take up to ten tools, whatever the brand, and remanufacture them for a total price of just £25. QuickEdge is just part of Quickgrind’s innovative tooling philosophy ‘total solution engineering’ developed here in the UK. This includes a tooling performance consultancy service and a tool management system which ensures customers have the perfect tool for each job, uncomplicated tool libraries and a cost-cutting tool management system. The special offer applies to as many as ten identical 6 to 16 mm tools. Quickgrind on 01684 294090 or email [email protected].